Craig Bellamy and Tony Pulis are both out of the running to replace Ole Gunnar Solskjaer as Cardiff City manager. 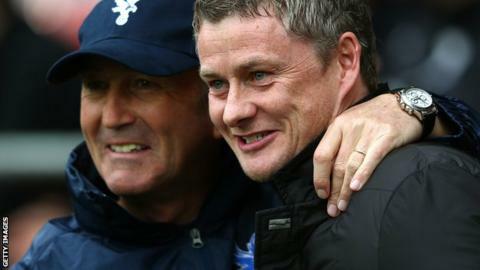 Solskjaer stepped down as Bluebirds boss on Thursday after less than nine months in the role. Asked if he would take the Cardiff job if owner Vincent Tan called him, ex-Bluebirds forward Bellamy said: "No, certainly not." Pulis meanwhile is not being considered for the role. The former Stoke and Crystal Palace boss was favourite with bookmakers and many fans to take over from Solskjaer, but he is not an option that appeals to Tan, reports BBC Sport's David Ornstein. The Malaysian businessman is unlikely to opt for a big name - with former Bluebirds boss Dave Jones also understood to be out of the running. Tan is keen for the next appointment to help create a new culture at the Championship club and assume a head coach role, in a more continental set-up, that sees areas such as transfers left to the Cardiff hierarchy. He is also keen to avoid paying significant compensation to lure an in-work manager out of their current job and will expect the new man to work with the players at his disposal, rather than make substantial changes in January. He plans to consider younger candidates and coaches already working for the club. It is not known whether these include veteran defender Danny Gabbidon and Scott Young, who are in temporary charge, and will take control of the team for the visit to Derby on Saturday. Bellamy, 35, ruled himself out of the running on Thursday. He made 90 league appearances in two spells with Cardiff City, scoring 17 goals. The 78-times capped Wales international claimed to have turned down the role before Solskjaer was appointed to replace Malky Mackay in January. "Look, I had the opportunity at Christmas to do it when Malky left," Bellamy told BT Sport. "They offered it to me then; whether it was part-time I didn't really give them a chance to get into so much of a conversation. "It was that simple, I'm not right for the club at this present moment. "They need to go in a different direction and the club's not right for me at this present moment." Bellamy retired as a player at the end of the 2013-14 season, and has previously said his ambitions include managing Wales and Cardiff City. Born and raised in Cardiff, Bellamy secured a place in the club's folklore by helping them secure promotion to the Premier League under Malky Mackay in 2013, and scoring the winning goal in a south Wales derby against Swansea City in 2011. The announcement of Solskjaer's departure was made after the 41-year-old former Manchester United striker held talks with Cardiff chairman Mehmet Dalman.